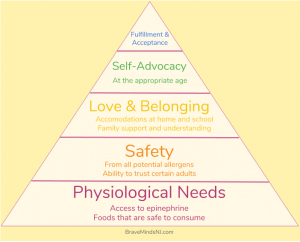 In Part 3 of this series, we finalize our discussion of the Food Allergies Hierarchy of Needs. Now that we’ve tackled Physiological and Safety needs, let’s move onto Love & Belonging, Self-Advocacy, and Fulfillment & Acceptance. Once you’re on the same page about your child’s physiological and safety needs, it’s time to focus on love and belonging. When one parent takes on the majority of responsibility for educating their child’s community about food allergies, it can be overwhelming. It becomes even harder if the other parent actively or passively disagrees. Let’s say your child makes a new friend at school; we’ll call her Mia. Your co-parent has met Mia’s mother and scheduled the playdate, casually mentioning that your child is “slightly allergic” to tree nuts. When Mia’s mother admits that she hasn’t had much experience with food allergies, your co-parent tells Mia’s mother to “not worry about it too much” because your child “knows what they can and cannot eat”. When you go to drop off your child at Mia’s house, you explain your child’s allergies in detail and at length. Mia’s mother shows some confusion, stating that your co-parent told her to “not worry about it too much”. Mia’s mother doesn’t feel equipt manage your child in the case of an emergency and you don’t feel comfortable leaving Mia. Your child feels excluded, like a bother, and thus a lack of belonging at her new friend’s house. In this scenario, the absence of a mutual understanding resulted in your child feeling out of place. Educating others about your child’s allergy, in a cohesive way, is an opportunity to increase your child’s sense of belonging in the community. In the context of family, a sense of support and understanding is vital to your child feeling like they belong. 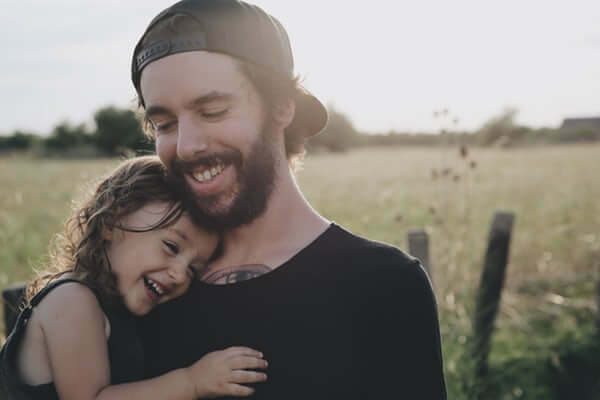 You and your child’s other parent should demonstrate a united front with relatives even if you don’t completely agree with the other’s parent’s stance. Disagreements in front of relatives leave it up to the relative to decide which food allergy safety strategy is good enough. That’s a decision for parents, not relatives. Co-parents are both responsible for educating members of the family, especially grandparents and siblings. Adult relatives who sneak food or make light of the allergy should be addressed by the parent who is their relation. That’s right, if your mom doesn’t seem to get it, it’s your job to address her, not your spouse’s or co-parent’s. In addition, tension over your child’s food allergies, such as teasing by siblings, should be taken seriously and handled by both parents. A united front will show children that their needs are important to the entire family. Framing responses in respect to how people in the family are expected to treat one another reflect your love and respect for all your children as opposed to making it just about food allergies. Providing siblings with examples about how everyone sacrifices in one way or another for each other also helps send the message the this is how we behavior in the family. 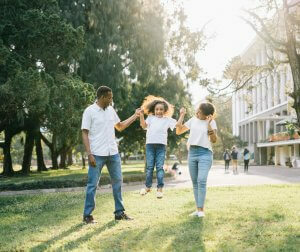 When it comes to school, co-parents who are not already on the same page should work together to implement and continue accommodations for their child. When meeting with your child’s teacher, for example, make an effort to have both parents present. If the managing parent is mostly responsible for this, it’s time to let the relaxed parent join in on this process. 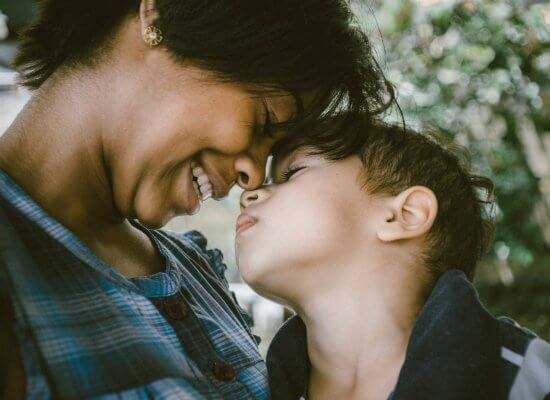 Let it be known to teachers, doctors, all caregivers, and most importantly your child, that creating comfort and belonging is a shared responsibility. With your co-parent, discuss the appropriate ages for your child to start advocating for themselves. This could mean learning how to read and fully understand food labels, speaking for themselves at restaurants, and making safe choices when parents aren’t around. This should be a gradual process, where both parents take on the responsibility of educating their child. How does our child feel about advocating for themselves? When we’ve given them responsibility, how did they react? Have we given them enough praise about the progress they’ve made so far? On the other hand, when both parents hold the same standards for responsibility, your child gets a clear idea of how independent and responsible they can be. The final needs in this hierarchy are your child’s sense of fulfillment in life and acceptance of their allergies. As you already know, food allergies greatly impact your child’s ability to fully experience life. 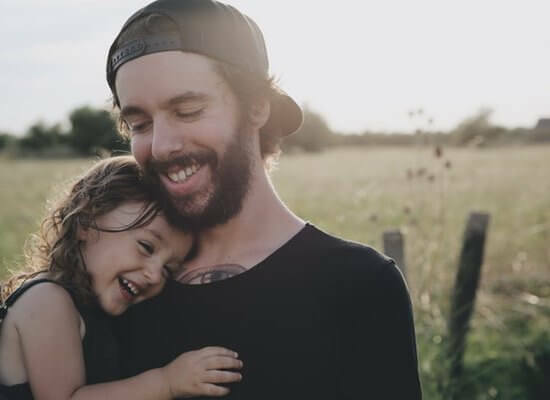 When parents are not on the same page in helping their child find fulfillment and acceptance, it creates emotional challenges for the child or adolescent. Your child needs to live life anyway. 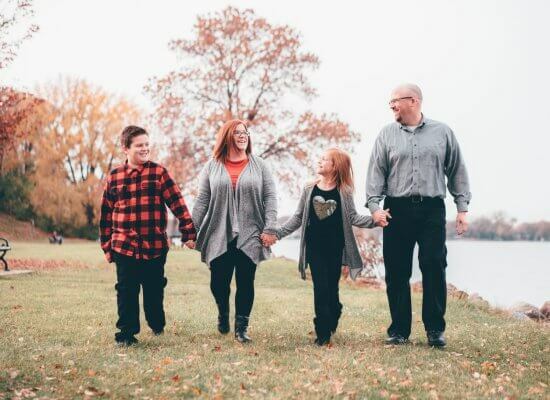 They need to accept their food allergies as a piece of who they are and how their body works; they need to make appropriate plans, have their epinephrine, and live life anyway. Obviously, this will look different for different kids with different types of food allergy conditions. Regardless, as your child grows into a blossoming teenager and a functioning adult, it’s crucial that both parents help them live a fulfilling life in connection with, but not a slave to, their food allergies. In many instances, it can feel like food allergies take away from a certain experience. Vacationing to a new location, celebrating holidays at a relative’s house, and even heading off to college are all impacted by the threat of food allergies. However, there is hope to help your child find fulfillment and acceptance in connection with their food allergies. It is possible to acknowledge and accept the challenges that come with food allergies while still celebrating the experiences of life. In addition, the more food allergies challenges can be framed as opportunities for growth in your child, yourself and others, the more empowered your child will be. With enough experience, your child can educate their friends about food allergies and reactions to allergens. Perhaps your child can even be an advocate for food allergies, or a “chef-in-training” who specializes in the cooking and baking of safe foods. The challenges of living with food allergies can indeed be seen as opportunities for strength-building. In doing this, they will learn not to shy away from life’s offerings. Rather, they will look for the ways they can seize opportunities. You, your co-parent, and your tribe are giving them the skills and confidence to manage their food allergies, other challenges, and embrace life. It is key to approach this as a united front, without undermining or downplaying your co-parent’s perspective. A positive change in perspective brought about by yourself and your co-parent makes a world of difference. This can help your child accept the difficulties of life with food allergies and yet find fulfillment in life. Most importantly, it can be done as a cohesive team. Contact us for a free phone consultation. 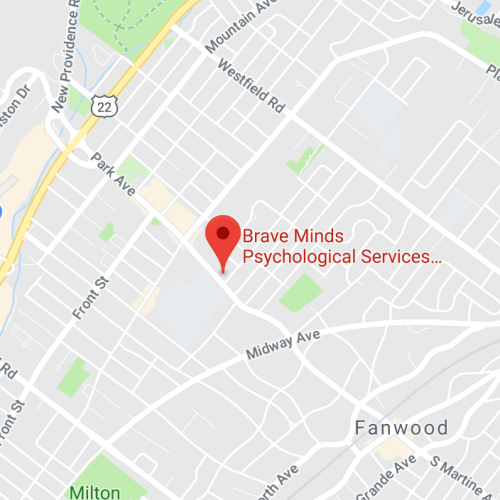 Brave Minds Psychological Services helps children, teens and families overcome severe anxiety, stress, and painful experiences. We specialize in developing brave minded youth that can move forward despite fears and significant challenges. If this is an emergency, do not use this form. Call 911 or your nearest hospital.